I have watched The Cheese Plate for quite some time on Facebook. The pictures that I have seen show so much gourmet cheese plates and creative sandwich options. My only thought was, could they really taste as awesome as they look? I had to answer that question. The hardest thing to do was narrowing down what exactly we were going to eat. I wanted one of everything. I loved that that owner, Nick, was so kind and helpful. I also loved that there was no line (it was early afternoon) and I could ask lots of questions while I tried to decide. We settled on the Cheese Lovers Oregon Cheese plate, The grilled cheese with medium and aged local cheddar, cart-made ale & chive mustard, toasted on beer bread and the Spicy Kale and Garlic Cheese on toast. I was the most excited about the cheese plate. It just looks so sophisticated… for a food cart! It came with 4 local cheese’s, cart made pub cheese, which was delicious, seasonal condiment, which was a pear compote and these amazing cart made crackers, that were so very different than anything I had ever had. Also there were pickled beets, saffron popcorn and goat cheese and chocolate truffle. Everything was great. I even brought some left over cheese home. The sandwiches did not disappoint either. 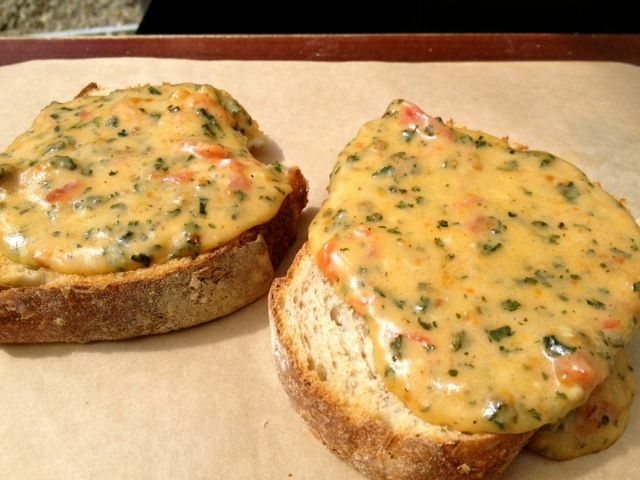 The Spicy Kale and Garlic cheese was melted and poured over toast. It was great, not super spicy, but just enough kick. 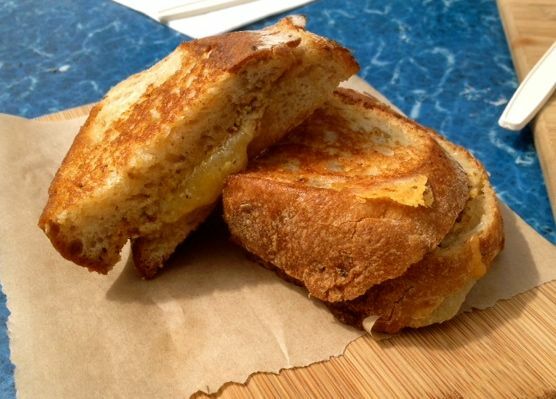 The grilled cheese with the cart made mustard was very good and just different enough to make it stand out. I still want to go back and order the Early Spring Sammich and the Cilantro Goat Cheese Spring Rolls. Yes, I will be back, I need to try just a few more things! The Cheese Plate easily makes my favorites list. I love so many things about this place, but one more thing I really need to mention. I love that they serve it on cutting boards. There is very little waste and I love that, plus it feels more gourmet. The menu is always changing with the seasons. I love that, so what I ate, might not be on your plate. Atmosphere at this food cart pod is a happening one. They have fire pit in the middle and a place for bands to come play live music. There is also a beer cart there, so you can wash it all down with Captured by Porches beer. Service was great. Like I said Nick was super helpful and just super nice!!! Pricing was great. It’s right around $6 for sandwiches and some of them were really big. Captured by Porches has great beer right next door.Other than that they have Dry soda and water. 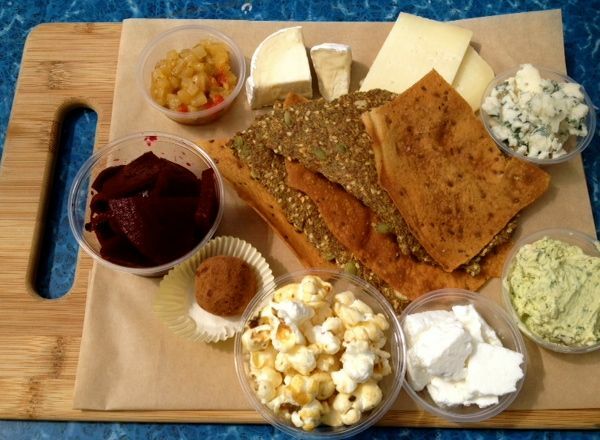 The Cheese Plate is located on Alberta and 23rd. Oh my gosh. How have i missed this place!?!? I’m going to try to check it out this weekend! Love your site BTW. you have reviewed a bunch of places i’d like to try. I blog about Portland too, but not only about food. I also write about cool stuff to see and do around town.